PhD students! An edifying tale for you. Click image for the results of this rather alarming search. Sixty abstracts, but only twelve places at the workshop: tough competition. If you’re submitting an abstract for a workshop or a conference, the chances are the organizers will be wading through at least this many abstracts—more, quite likely, since the workshop I’m organizing is in a relatively small field. They will be doing what my co-organizer and I did this morning: looking for reasons to eliminate abstracts and get down to a manageable longlist. And this will be surprisingly easy, as it was for us (we’re now discussing a final programme). Here are a couple of things you may want to bear in mind, then, based on my experience this morning, and similar experiences running workshops in the past. First, there’s a good reason why CFPs (if you’re a first year, that means ‘calls for papers’) usually set a word-limit for abstracts. Respect this, even if it seems ungenerous. Our word limit was 250 words, and at two minutes per abstract that meant I had plenty of time to read abstracts that kept to the limit. You only have to do the maths to see that 60 x 250 makes for a fairly manageable 15,000 words—only the length of an MA dissertation. Several of our sixty were in the 400–650-word range; none of them got onto the longlist. The last abstract (surname beginning in Z) came in at a laconic 122 words, and I’d have been tempted to accept it on those ground even if it hadn’t been entirely to the point—which it was. Second, and much more important, what is the conference or workshop about? The title tells you something; the text of the call for papers tells you more. Of the sixty abstracts I read this morning, there were only a handful that just weren’t very good. (A lower proportion than usual, actually.) But at least twenty-five of them disqualified themselves because they didn’t show how the paper would relate to the aims of the workshop, as carefully laid out in the title we’d chosen and the call for papers. Many of these were very good. But we had at least a dozen abstracts that were really good and demonstrated why they were relevant to this particular workshop, with these particular aims. Some good news for you: as a rule, PhD students are better at this than more established researchers, many of whom seem to have a pre-written abstract ready to sling off at anyone foolish enough to say ‘travel and accommodation costs will be covered by the organizers’. Bear these in mind when you’re writing your abstract and the organizers will thank you! 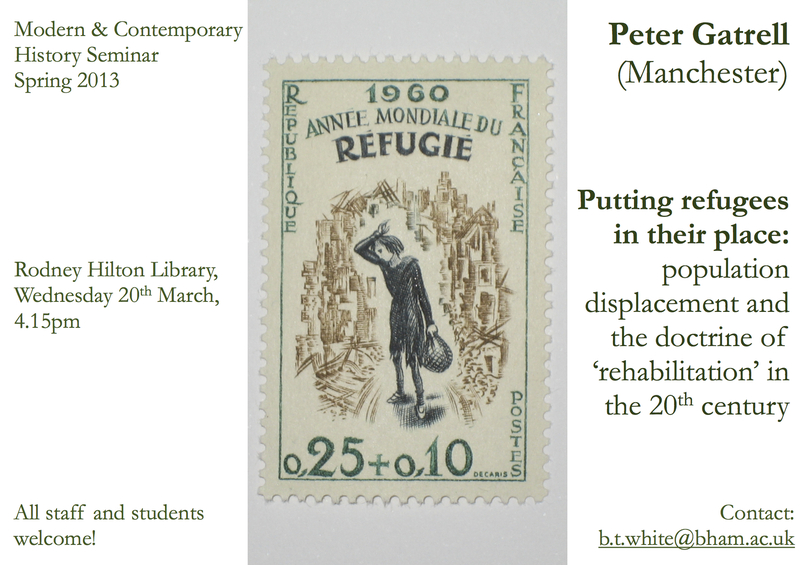 Our final seminar speaker for this term is Peter Gatrell of the University of Manchester, making his second trip to Birmingham in less than a week after participating in the first non-state humanitarianism network workshop last Friday. As usual, the seminar takes place in the Rodney Hilton library on Wednesday afternoon—full details below. This seminar is also featured in the programme of the university’s Arts and Science festival. With Kevin O’Sullivan of the National University of Ireland, Galway, our colleague Matthew Hilton is coordinating a research network on non-state humanitarianism, funded by an AHRC research networking grant that will cover a series of workshops over the rest of 2013. The first is taking place tomorrow, Friday 15 March, here in Birmingham, in the delightful surroundings of Winterbourne House and garden (warning, slightly irritating music). Participants will be joining us from several universities in the UK, Ireland, Germany and the USA, as well as from the Overseas Development Institute and Save the Children. You can read about the network here, and about tomorrow’s workshop here. It’s a small, closed workshop, but the research agenda it’s hoping to generate will be publicized on the website. You may also notice a certain er family resemblance between this blog and the network’s website. Full disclosure: Kevin used this theme first, for a blog he was running while a postdoc at Birmingham last year. We liked it and adopted it too. But he had never in his life—nor had anyone he knew—worked or slept in a room that was not exceedingly cold. —Penelope Fitzgerald, The Blue Flower. The person described is Fritz von Hardenberg, in a cold room at Tennstedt in Saxony one day in the 1790s. I thought of him as I sat in my exceedingly cold office today, watching thick flurries of wind-blown snow alternate with brilliant sunshine. 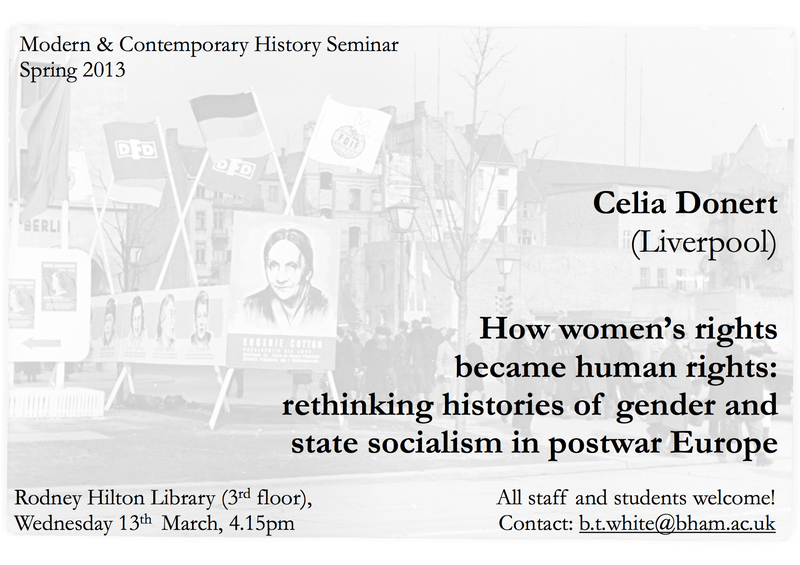 Our week 10 seminar speaker is Celia Donert (Liverpool)—time and place as usual, all details below. A few years ago, an Egyptian friend who was about to get British citizenship told me about a book called Beer in the snooker club, by Waguih Ghali—she said it was one of her favourite books about Egypt (and favourite books, full stop). She lent me a copy which I started but never got round to finishing, and she asked for it back when she moved cities to start a PhD in literary translation. That copy was from the 1987 reissue of a book originally published in 1964. In December 2010 the book was once again reissued, by Serpent’s Tail (click the image for a link), with eerily good timing, as we’ll see. Yesterday I was in Oxford, after giving a seminar on Friday night, and I made my usual pilgrimage to Blackwell’s. They had a display table of ‘Translated Arabic fiction’—a slightly misleading title, since Beer in the snooker club was written in English (by an Egyptian whose first language was French and whose Arabic was ‘deplorable’), and a couple of other books on the table were translated into English from originals written in French: Tahar Ben Jelloun’s This blinding absence of light, the latest Amin Maalouf. Translated Arab fiction would have been more accurate. Still: there I was, and there was Beer in the snooker club, so I bought it. I knew I’d have a longish train journey home that afternoon, and last week I had confirmation that I’ll be teaching my second-year option module on Middle Eastern cities again in the autumn term—I’d already put the novel on the reading list on the strength of my friend’s recommendation. It’s quite a short novel; I read the first half on the train home, and the second half yesterday evening before I went to bed. There is a tailor in old Cairo who has been cutting suits for our family for years. I go to him, choose a cloth, have it tailored, and somehow the bill is mysteriously paid. Ram is funny, ambivalent, and unhappy. Entirely of his class, he also despises it—especially after his time in England makes him increasingly conscious of, precisely, class. He feels Egyptian, as does his (richer, but more politically radical) lover Edna—but he is a Copt, she is a Jew, and both of them belong to an elite that has little in common, not even the Arabic language, with the ordinary Egyptians whose exploitation funds its glittering lifestyle. By the book’s own argument, it isn’t about Egypt at all: Ram knows little of Egypt except Cairo and Alexandria, and as Edna tells him, Cairo and Alexandria aren’t Egypt. But what she means is that his Cairo, and for that matter hers, are not Egypt: the Cairo of the Gezirah Sporting Club (“where middle-aged people play croquet. Imagine being a member of a place where middle-aged people play croquet”). The only member of Ram’s family who speaks Arabic and dresses like an Egyptian is the uncle who lives in upper Egypt and manages their collective estates: he is much closer to the fellaheen, the peasants, even though he is the one who is directly responsible for exploiting them. The strange thing about this club is that in the early days of the revolution, it was condemned as a symbol of exploitation and was taken over by a committee or something like that. Well, all the members are still members, with a few additional military members. I repeat the word ‘members’ à propos the military newcomers, because they too have acquired this floating, breeze-like, ethereal quality. Ram’s tragedy is his detachment: he’s always able to observe critically, even when what he is observing is the artificiality of his own supposedly critical detachment. There’s no way out for him. Alongside his alcohol-soaked life as a privileged drifter, he is engaged in dangerous political activities, collecting evidence of torture and murder in the new regime’s prisons and camps—but the novel’s ending offers neither heroism, nor acceptance, nor redemption. So the book is a beautiful, funny, profoundly sad and even more profoundly ambivalent portrait of Cairo in a period of revolutionary change: that’s why I’ll be recommending it to students in the autumn, and that’s why the most recent reissue, weeks before the Tahrir demonstrations started, was so timely. The novel deserves a readership on its own literary merits, which are abundant; but, precisely because it doesn’t offer easy interpretations, it is also an excellent place to get historical perspective on the current revolution in Egypt. Whether many Egyptians (other than my friend) are reading it, I don’t know: certainly I doubt that most members of the Muslim Brotherhood would go looking for lessons in an anglophone novel by a francophone Egyptian about a semi-alcoholic Copt who is unfaithful to his married Jewish lover—or recognize the claim both these characters make to be Egyptian, which they are in their own minds but probably aren’t in the minds of the new regime or the supporters it is seeking among the Egyptian masses. The novel is also as much about London as about Cairo: the London experienced by Ram (and the author) in the 1950s, and the London he half imagines, half remembers, after his return to Egypt—there’s a piece about it on London Fictions. The 1987 reissue was spurred by the publication in 1986 of the publisher Diana Athill’s memoir After a funeral, which is about her relationship with Waguih Ghali, who committed suicide in her flat. This is still in print—an extract from it forms the introduction to the new reissue—and I was planning to buy it until I read Ahdaf Soueif’s review of it (behind a pay-wall, sorry). Soueif offers a warm appreciation of Beer in the snooker club, but finds Athill’s book horribly patronizing. I may read it anyway. I wrote in a post about Jim Crace’s Harvest the other day that historical novels are often a better way of getting a feel for the past than history books; that goes even more so for novels that belong to their era—especially one like Beer in the snooker club, which communicates a powerful sense of what’s changing by concentrating on one unhappy life. Incidentally, I picked up a copy of Harvest at the same time. There may be another post about it before too long. Kremlinology, as defined by the OED, is “the study and analysis of the Soviet Government, and subsequently the Russian government, and their policies”. A sharper definition would explain that in the absence of the sort of open information about the workings of the Soviet government, western observers of Soviet affairs would bring almost occult skills of analysis to whatever scant information they could get: a handshake given (or withheld) at an official ceremony would lead to elaborate extrapolations about the likely direction of policy; photos of the same ceremony issued by the state media might give rise to theories that such-and-such a general was about to be liquidated, or already had been; and so on. Frequently these extrapolations rested mostly on the imagination of the analyst, as I was reminded by a recent article on Iran which described the fanciful analyses produced by “the sublimated Kremlinology that passes for Iran-watching” in Washington. What, I wonder, would a Kremlinologist have made of this photo? On the right is Lyndon B. Johnson, president of the USA. On the left is Robert F. Kennedy, attorney-general, and younger brother of John F. Kennedy, whose assassination in Dallas had given LBJ the presidency. The two men are at an official ceremony: the ground-breaking ceremony for the John F. Kennedy Center for the Performing Arts, Washington, D.C., December 1964. The point of Kremlinology was that it made use of occult readings of scant information because the processes of Soviet decision-making were closed, secretive, and restricted to a party elite: in a one-party system with strict control of the media, Soviet citizens and western observers alike had no ready supply of information about how policy was formed. Second-guessing the existence of rivalries and power-battles by (over-)interpreting the public appearances (or disappearances) of the few people whose decisions mattered was all that was left. All of this, of course, was supposedly by contrast with the open workings of power in liberal democracies, where legislatures, executives, and judiciaries all operate according to publicly-known rules, their activities often public also, and all under the watchful eye of a free and independent media. Yet McCarthy, with his coarse affability, leaped to his feet when Johnson approached, greeted him as “Leader,” and shook his hand. His aides followed suit, all but one, who remained seated, with an expression of distaste. Bobby knew what Johnson had been saying about his father and his boss, and he always bristled at slights directed at his own revered family. He refused to get up, or even to look at Johnson. Johnson, whose own history of humiliations Caro has traced in earlier volumes, was just as quick to sense contempt, and determined to crush it if he could. He was a bully and a sadist, and he took the earliest opportunity to force Kennedy to submit to the dreaded handshake. He went right up to him, towering over him (he always put his height to use) and crowded at him with a half-extended hand. Finally, in the embarrassment of a growing silence, Kennedy rose and, with averted eyes, shook Johnson’s hand. Johnson felt he had made this lowly staffer crawl. It would prove to be a costly victory. The depth of hatred between Bobby Kennedy and LBJ, in particular, and the influence it had during John F. Kennedy’s presidency and following his death, was remarkable. Here’s another handshake, this one from November 1963, after Johnson’s address to Congress following JFK’s assassination. (Bettmann/Corbis; click for source.) Have you ever seen a smile look more like someone wrinkling their nose at the smell of a fresh turd than Kennedy’s here? And it’s not so much a handshake as an awkward clutch: Kennedy looks like he’d rather be holding a red-hot iron, but Johnson has got him firmly in his grasp. “I’ll cut his throat if it’s the last thing I do,” he once told a friend. I doubt that Caro, when he began his huge project, thought he would end up composing a moral disquisition on the nature of hatred. But that is what, in effect, he has given us. You are dealing with a very insecure, sensitive man with a huge ego. I want you literally to kiss his fanny from one end of Washington to the other. (Note for British readers: it means something different over there.) Both reviews make for compelling reading, in a grim, so-horrible-you-have-to-look kind of way. It sounds like the book does, too. I wonder if there are any retired Russian intelligence analysts reading it and nodding, thinking, “Yes—I was right all along”? 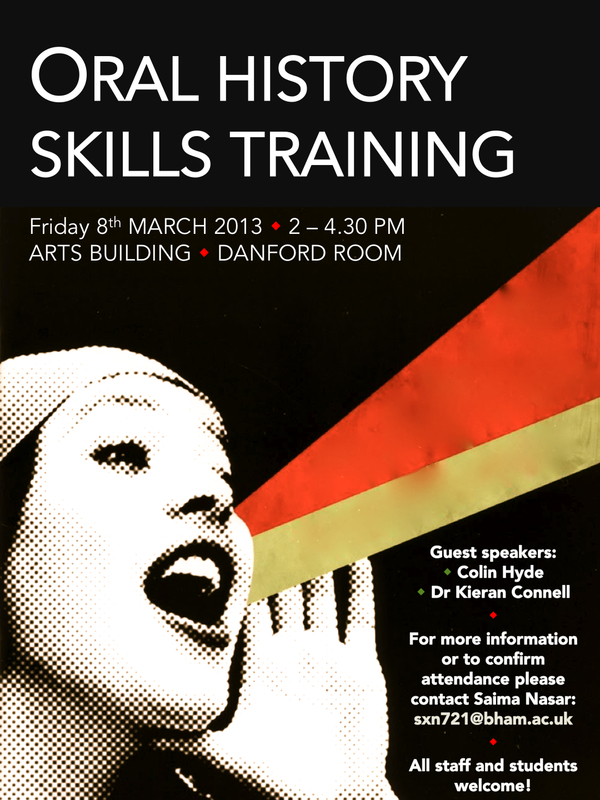 One of our excellent PhD students, Saima Nasar, has organized an oral history skills training session to be held this Friday, 8th March, 2–4.30 pm, in the Danford Room (second floor) of the Arts building. The session will be led by Colin Hyde from the East Midlands Oral History Archive. Colin will be running through the basics of oral history, including: planning an oral history project, interviewing, recording, ethics, transcribing and archiving. For the last half an hour Dr Kieran Connell (recently returned to Birmingham as a Research Fellow on this project) will be running an informal Q&A session. All staff and students are welcome. For more information, or to confirm attendance, please contact Saima Nasar at the address in the poster. Sorry for the late notice, inevitable in the circumstances: the Tuesday afternoon event on ‘The emergence of Western Kurdistan‘ and the associated careers talk are cancelled owing to illness. We hope to reschedule them in future—look out for further details here. Beware of doing an internet search for ‘sick photos’.